My fabrics I ordered from Sew Sisters in Toronto have arrived, you can read more about the selection here. 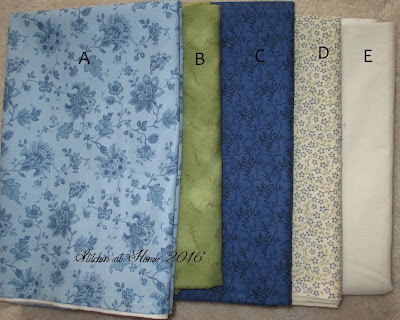 A, C and D are from the clearance fabrics I ordered. Fabrics A and D are 'Color it Blue' by Faye Burgos, B is'Quilters Basic Dusty Style' by Stof, B is 'Glengarry Manor' by Northcott, E I bought on sale at a LQS and I can't make out the writing in the selvedge. A mystery fabric in a mystery quilt sounds fitting. I'm all set for the next step in the Meadow Mystery Quilt with time to spare... Well okay maybe only a week. Hi Cyndy: I'm looking forward to seeing your version of the quilt the blues and greens look great together.